Northgate Free Methodist Church is continually opening its doors to the community and is inviting everyone to their fall kick-off events throughout September. Beginning with a new message series starting on Sept. 8th and 9th, pastors Vern Saile, John Keller and Marsha Rivers will examine the "Fruit of the Spirit" -- characteristics of love, joy, peace, patience, kindness, goodness, faithfulness, gentleness and self-control -- and how we can bring more of these into our lives. Grief Share, a 13-week group designed to help and encourage those grieving the loss of a loved one due to death. The format is a weekly video presentation and discussion time that offers hope and comfort. Find more information at http://www.griefshare.org/about. Meetings will take place on Tuesdays from 6 to 7:30 p.m., starting Sept. 18th, at Northgate’s North Campus, 8160 Bank Street Road, Batavia. Divorce Care, a friendly, caring group of people who will walk alongside you through one of life’s most difficult experiences. Don’t go through separation or divorce alone. Divorce Care seminars and support groups are led by people who understand what you are going through and want to help. You will learn how to heal from the deep hurt of divorce and discover hope for your future. A new 13-week session begins on Saturday, Sept. 22, from 6 to 7:30 p.m. at Northgate’s North Campus. Mothers of Preschoolers or “MOPS” are women who gather together twice a month to share and support each other in the remarkable journey that is motherhood. Meetings consist of relevant speakers, fun crafts, supportive conversations and fellowship. There is always hot coffee and childcare is provided at MOPS meetings. Moms can choose a 9 a.m. group or a 6:30 p.m. group – both meetings begin on Sept. 25th. MOPS is open to all moms with children from birth until their youngest child finishes kindergarten. MOMS Next is also available for moms of school-age children; they meet every second and fourth Wednesday from 6 to 8 p.m. Visit Northgatefmc.com/mops for more information. posted by Billie Owens in Cornell Cooperative Extension, master gardener program, Gardening, news, Announcements. If you are interested in taking the Master Gardener training this fall, we still have a few spots open. Classes will be held on Wednesday evenings from 6 to 9, starting Sept. 5 and running through Nov. 14. There will also be a full day of classes on Saturday, Nov. 3. Classes will be held at the Cornell Cooperative Extension office at 420 E. Main St., Batavia. Each class will focus on a different horticulture topic. Anyone interested in learning more about gardening may attend the course. Preregistration is required and has been extended to Aug. 30 or until the class is full. The fee for this horticulture training is $225 per person, which includes all class sessions and materials. The Cornell Master Gardener manual is available online. If you have a passion for volunteering and gardening, this training is the first step to becoming a Genesee County Master Gardener volunteer. A Master Gardener volunteer should have a willingness to give back to the community and help put into practice what they learned at training. Enthusiasm for sharing their gardening skills and knowledge is a must. Graduates of the program (Genesee County residents) are then eligible to apply to become a volunteer. For an application or to register contact Brandie Waite at 343-3040, ext. 101, or stop by the Extension office located at 420 E. Main St. in Batavia. posted by Billie Owens in news, Announcements, batavia, Genesee Chorale, music. Calling all singers! Join with the Genesee Chorale in preparing for a holiday concert of glory and majesty, including the "Hallelujah Chorus" from Handel’s "Messiah" and a newly commissioned work celebrating the beauty of Letchworth Park. First season rehearsal is 7 to 9 p.m., Monday, Sept. 10, at St. James Episcopal Church, 405 E. Main St., Batavia, with other rehearsals following Monday evenings leading to Dec. 12, 14 and 16 concerts. posted by Billie Owens in Bethany, water district #5, news, infrastructure, Announcements. There will be a public informational meeting for the proposed Bethany Water District #5 on Monday, Sept. 17, at 6 p.m. at the Bethany Town Hall. This is to discuss the $14.5 million water project for most of Bethany. Bethany Town Hall is located at 10510 Bethany Center Road in Bethany. posted by Billie Owens in East Pembroke Fire District, news, Announcements. Please take notice that a Workshop meeting will be conducted by the East Pembroke Fire District to be held on Wednesday, Sept. 18th, between the hours of 7 and 9 p.m. EST. It will be held at the East Pembroke Fire District Hall, located at 8655 Barrett Drive, Batavia. Purpose of the Workshop meeting is 2019 Fire District Budget. posted by Billie Owens in GCC, Genesee Center for the Arts, Roz Steiner Art Gallery, art, news, Announcements. The Genesee Center for the Arts at Genesee Community College in Batavia announces the confirmed events for 2018-2019 coming season. Brighten your holidays -- literally -- with "A Very Electric Christmas," performed by Lightwire Theatre on Sunday, Nov. 18 with two shows at 2 p.m. and 7:30 p.m. at the Stuart Steiner Theatre in Batavia. Audiences of all ages will love this magical and captivating tale of family, friendship and hope set to timeless holiday hits. Check out the production trailer here. The Fall exhibit schedule begins with "Portraits on Recycled Trash" by Dion Hitchings on display from Aug. 23 - Sept. 22 in the Roz Steiner Art Gallery. Through the untraditional media of children's art supplies and consumer boxes, Hitchings offers a glimpse into a unique world that is filled with altered and complex viewpoints giving the audience an opportunity to "think outside the box." Gallery receptions will be held at 1 and 5 p.m. on Aug. 30. Welcoming visitors into the Stuart Steiner Theatre lobby from now through Sept. 22 is an impressive photography exhibit entitled "Landscape Interaction/ Intervention" which celebrates the work of students enrolled in GCC's Intermediate Photography; a Collaborative Online International Learning (COIL) class taught by Associate Professor of Photography and Art Joe Ziolkowski, in collaboration with Associate Lecturer at the Royal Melbourne Institute of Technology's School of Art in Australia, Rebecca Najdowski. Experience the powerful images that expanded student knowledge of landscape, trans-national, trans-cultural and trans-photography concepts between the United States and Australia. The exhibit is simultaneously on display at GCC and RMIT University in Melbourne, Australia. More of the student's works are visible here. Meet the talented contributing artists at the gallery receptions at 1 and 5 p.m. on Aug. 30. From Oct. 4 - Oct. 25, the Galley will display a photographic exhibit by Ryan Gustman. Diagnosed with Asperger's syndrome early in life, Gustman spent most of his adolescence alone, in his own world, with no outlet until he discovered a passion for photography. While engaging in urban exploration he found a way to calm his mind and his soul through photographic documentation of abandoned buildings. Lecture will be held on Oct. 25 at 12:30 p.m. and receptions at 1 and 5 p.m. will follow. Going beyond conscious intention to make coherent images from irrational juxtaposition of disparate parts is the impetus of Emily Kenas' work. While making new sense of recognizable materials, her work "Assemblage" occupies a space between painting and sculpture and will occupy the Gallery from Nov. 13 - Dec. 14. Kenas will lecture on Nov. 29 at 12:30 p.m. and receptions at 1 and 5 p.m. will follow. A collection of paintings by Muhammad Zaman, entitled "Finding Amal" will be exhibited from Jan. 22 - Feb. 22. Amal, meaning "hope" in Arabic is what Zaman hopes to inspire through his work. "Finding Amal" features compositions of urban calligraphy that combine the three languages that are the cornerstones of the artist's culture: Arabic, English and Bangla. Each individual canvas expresses a word, phrase or concept as if they were messages dedicated to the entire human race. The artist will lecture on Jan. 31 at 12:30 p.m. and receptions at 1 and 5 p.m. will follow. 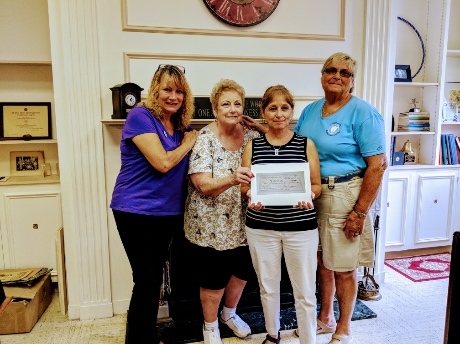 posted by Steve Ognibene in news, Announcements, business, scholarships, Batavia Business and Professional Women's Club.. The Batavia Business and Professional Women’s Club Inc. (BBPW) will hold its annual Basket Raffle & Live Auction & Dinner on Oct. 13 at the Ascension Parish Hall on Sumner Street in Batavia. Please support the club's fundraising efforts by joining us. Doors open at 5 p.m. and dinner will be served at 6 o'clock. Basket drawings and live auction to follow. Tickets are on sale now for $25 each and include appetizer, dinner, dessert and a sheet of basket raffle tickets. Tickets are pre-sale only and must be purchased by Oct. 7th. The theme for this informal occasion is "An Evening in the Magical Kingdom." We encourage you to come ready for some fun and help us help our youth and service organizations in Genesee County. This is the club's biggest fundraiser of the year. This event is for both men and women. To purchase tickets or if you cannot attend and would like to donate a basket, gift card, monetary donation or other item(s) to the auction, please contact Michelle at 585-297-0779 or send an email to [email protected]. All proceeds from this event will benefit the 2019 Genesee County scholarships and the service organizations awards. Help us, help them! The June 2018 Scholarship Award winners were: Ethan Hutchins (Notre Dame), Kelsey Kasmarek (Batavia), Abigail Klos (Oakfield-Alabama), Grace Krizen (Pembroke), Madison LaGrou (Oakfield-Alabama), Gordon Montgomery II (Batavia) and Erik Sharlau (Alexander), Alexis Breton (GVEP), Jessica Hicks (GVEP) and Sabrina Walton (GCC). The high school Students each received a $750 check to support their educational and career goals. The Genesee Community College (GCC) adult student received a $500 scholarship award and the Genesee Valley Educational Partnership (GVEP) students each received a $250 scholarship award. Additionally, BBPW club members awarded four Service Awards to be distributed this year. This year, five $300 awards were given to Genesee Cancer Assistance, Crossroads House, Operation Injured Soldiers, Bethany Volunteer Fire Department, and Project Stork. It is a 501c3 organization that has been an active part of the community now for 97 years. The group works together to help improve the lives of others. Throughout the year they raise money through various activities to provide scholarships for local high school seniors, Genesee Valley Educational Partnership (GVEP) students and adult GCC students as well as provide Service Award donations to several local charitable organizations. posted by Billie Owens in toastmasters, batavia, Announcements. 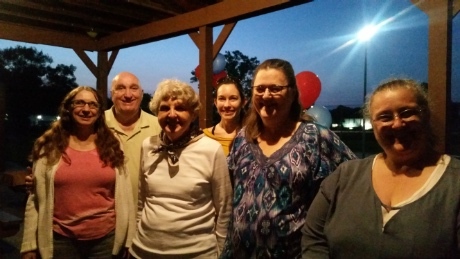 Last week, Speak Up Toastmasters held their annual summer picnic, kicking off a brand new season. Shirley Malone gave a speech called "Snap Shots of My Life." She created beautiful word pictures that made it easy for the audience to picture just how life was for her growing up in the days when grandma still churned butter. Eva Miller evaluated the 25-year Toastmaster veteran, proclaiming that it was the best speech she had ever heard Malone give. It was truly riveting; she had the audience at the edge of their seats. Patrick Olson led the members and guests in our favorite portion of the meeting, table topics, by asking questions about their favorite outdoor activities. There was a wide range of answers for all the questions that Olson had. Toastmaster members provided food for fellow members, family, and guests who cheered on our presenters for the evening. As always, food, fun education, guests and members make a great combination. If you are interested in excelling in your career, give Toastmasters a try. The best value for your dollar is available to you right here in Genesee County. Wouldn't you like to go from 0 - 100? The next meeting is on Sept. 11th at 190 Oak St. in Batavia at 7 p.m. We are accepting applications now. Hurry, seats fill up fast. Guests are always welcome to sit in on a meeting. Contact [email protected] or call/text 585-993-0515 for more information. posted by Billie Owens in immunizations, health department, news, Announcements. With the summer winding down, it’s time to get back in the swing of school and schedules. Whether it’s a baby starting at a new daycare, a toddler heading to preschool, a student going back to elementary, middle or high school – or even a college freshman – parents should check their child’s vaccine records. “Getting children all of the vaccines recommended by CDC’s immunization schedule is one of the most important things parents can do to help protect their children’s health,” said Paul Pettit, Genesee & Orleans Public Health director. August is recognized as National Immunization Awareness Month. Today’s vaccines protect against serious and potentially life-threatening diseases, including polio, measles, whooping cough, and chickenpox. Because of advances in medical science, your children and family can be protected against more diseases than ever before. Diseases can quickly spread among groups of children who aren’t vaccinated. Childcare facilities, preschool programs, schools and colleges are prone to disease outbreaks. Children in these settings can easily spread illnesses to one another due to poor hand washing, not covering their coughs and sneezes and other factors related to interacting in crowded environments. Babies and children are not the only ones who need protection against vaccine preventable diseases. Parents and caretakers need to be protected by vaccines as well to stay healthy for their family and community. Information on NYS Immunization Requirements for School Entrance/Attendance click here. Genesee County Health Department at: 344-2580, ext. 5555, or visit their website here. posted by Billie Owens in financial planning, financial peace university, batavia, northgate church, news, Announcements. Are you ready to change your financial future? Northgate Free Methodist Church is hosting its next semester of Financial Peace University, which will be held on Tuesday nights, starting on Sept. 18 from 7-8:30 at the North Campus. It is located at 8160 Bank Street Road, Batavia. Cost is $109 for class materials and one-year of FPU access, good for one person and their spouse. For more than 25 years, Financial Peace University, created by Dave Ramsey, has helped millions of people take control of their money. Through this nine-week course, Ramsey’s proven money class will show you step-by-step how to create a budget, pay off your debt, make wise spending decisions, and save for the future. Preregistration is required, so please visit www.northgatefmc.com and follow the Financial Peace link to sign up. If you have questions please email [email protected] or call the church office at 343-4011.
posted by Billie Owens in news, Announcements, GC Youth Lead Program, GC Youth Bureau. The Genesee County Youth Bureau is seeking applicants for the Genesee Youth Lead Program. Applicants should be a Genesee County high school student entering their freshman through senior year. The program is focused on developing leadership skills within an individual through each specific session and through hands-on experience. Each session will have a different focus on our community and leadership. The Youth Lead Program will take place at GVEP BOCES beginning Oct. 10, from 9 a.m. to 2:30 p.m. and will be held once a month on the second Wednesday of each month. The program dates are Oct. 10, Nov. 14, Dec. 12, Jan. 9, Feb. 13, March 13, April 10, and May 8. Youths who complete the program are encouraged to use the skills and information gained through their experience to support the communities in which they live. The selection process will be done through an application and interview process by the staff. The class size is limited. The program will cost $75 for each student. If there is an economic hardship please contact the Genesee County Youth Bureau. Applications for the program can be found here. Please contact the Genesee County Youth Bureau with questions at (585) 344-3960 or at [email protected]. posted by Billie Owens in GSO, Genesee Symphony Orchestra, Summer Serenade, news, Announcements, United Way, concerts, music, Le Roy. United Way's third annual Summer Serenade featuring the Genesee Symphony Orchestra will be held from 3:30 to 6:30 p.m. on Sunday, Aug. 19, at Mercy Grove. The venue is at 7758 E. Main Road (Route 5) in Le Roy. There will be hors d’oeuvres, grazing stations, beer, wine, soda and a cash bar is available. The GSO Serenade portion of the event will be from 4:45 to 5:30 p.m. Proceeds benefit the United Way Backpack Program and the GSO. Theresa DeMars, an account manager with Lawley Insurance, chairs the event for United Way. As in the previous two Summer Serenades, garden-party attire is appropriate. Donald Woodward built the mansion at Mercy Grove in 1927. Currently, the facility and its beautiful grounds are available for special events, conferences and weddings. Summer Serenade tickets are available at Le Roy Country Club, Roxy's Music Store, from United Way or GSO board members, and online here. posted by Billie Owens in Arc of Genesee Orleans, Friends & Family 5K and Fun Walk, news, sports, elba, Announcements. Arc of Genesee Orleans will hold its 14th annual Friends & Family 5K & Fun Walk on Saturday, Sept. 15 in Elba. There will be food, fun and music, plus kids' activities, including face painting. Cost is $20 for the 5K and $15 for the one-and-a-half-mile Fun Walk; but both rates will increase by $5 on race day for those not preregistered. For nonparticipants wishing to attend the post-event party, cost is $5. There is a small processing fee for online race/walk registrations. Participants can register for the 5K and Fun Walk online here. The race will be timed by PCR Timing Service of East Rochester. Money raised will benefit education through the organization's Mary Anne Graney Memorial Scholarship Fund, and programs and services for individuals with intellectual or developmental disabilities served by Arc, and their families. Sign up today for sponsorships, which range from $100 to $1,000. Aug. 15 is the cut-off date to put sponsor's names on T-shirts. On race day, check-in begins at 8:45 a.m. The 5K starts at 10 o'clock, with the Fun Walk immediately following. The starting line is at the Arc Day Habilitation Center main entrance at 4603 Barrville Road, Elba. posted by Billie Owens in CCE, Cornell Cooperative Extension, news, batavia, Announcements. Batavia -- The Cornell Cooperative Extension of Genesee County Board of Directors will meet at 5 p.m. on Tuesday, Aug. 28. The meeting will be held at the Extension Center at 420 E. Main St. in Batavia and is open to the public. Any questions should be directed to Yvonne Peck at 585-343-3040, ext. 123. The next 2018 CCE Board of Directors meeting will be at the same time/place on Nov. 20.
posted by Billie Owens in Gardening, cornell extension, batavia, news, garden talk, Announcements. Taught by Master Gardeners, programs will be held from 12:15 to 12:45 p.m. on the first Tuesday of the month. Bring your lunch to the CCE office at 420 E. Main St, Batavia and join us. This free series is open to the public. Registration is not required. On Aug. 7 check out “Autumn Awesomeness.” Fall is a great time to garden after so many of summer's challenges are past. If you'd like a garden filled with Autumn Awesomeness, we have a few ideas to get you started right away. Late interest plants are important, but there's more, and that "more" will make your garden sing year round. Sept. 4 drop in for “Tips on Ticks.” Learn about which ticks you may find in your backyard or farther afield. With tick encounters on the rise learn how to identify a tick, what diseases they may carry and how to protect yourself and your family from being bitten by a tick. Oct. 2 finds us exploring “A Witch's Garden.” Witches were once considered wise women and healers. They used plants they grew or found in their environment to cure ills as well as cast spells. You, too, may have your very own witch's garden...come explore the folklore and plants of the witch. On Nov. 6 we will wrap up the Garden Talk year with a demonstration on how to make an outdoor greens display for the winter. Get ideas for a creating a container that can take you past the holidays and look good all winter. Future topics and other Master Gardener events will be posted on the Cornell Cooperative Extension of Genesee County website here. Contact 343-3040, ext. 101, for more information about this or other CCE programs. posted by Billie Owens in Le Roy, Announcements, news, Botts-Fiorito Post #576, American Legion, flag disposal ceremony. On Sunday, Aug. 5, the Botts-Fiorito Post #576, American Legion in Le Roy will be conducting the fourth annual Ceremony for the Disposal of Unserviceable Flags. The ceremony will take place at the Northwoods Sportsmen Club, located at 8402 Gulf Road in Le Roy. Anyone with flags that need to be disposed of may drop them off at the American Legion Post, located at 53 W. Main St. Anyone interested in attending and joining in this ceremony are invited to be at the Northwoods Sportsman Club at 1 o’clock sharp, with the ceremonial presentation conducted by the Post Commander, followed immediately with the burning of the flags. posted by Billie Owens in news, Announcements, Cornell University Cooperative Extension, Gardening. If you are interested in becoming a Master Gardener Volunteer, Cornell Cooperative Extension of Genesee County will be offering Master Gardener training this fall. Classes will be held on Wednesday evenings from 6 to 9 p.m., starting Sept. 5 and running through Nov. 14. There will also be a full day of classes on Saturday, Nov. 3. Classes will be held at the CCE office at 420 E. Main St., Batavia. Each class will focus on a different horticulture topic throughout the training. Some of the horticulture topics we will cover include: botany, diagnosing plant diseases, entomology, soils and fertilizers, lawn care, herbs, vegetable gardening, weed identification, woody ornamentals, pruning, tree and small fruits, perennials, annuals, integrated pest management and organic gardening. By attending the Master Gardener training, you will become a more knowledgeable gardener. Anyone interested in learning more about gardening may attend the course. Preregistration by Aug. 24 is required. Class size will be limited. No walk-ins will be allowed. The fee for this horticulture training is $225 per person, which includes all class sessions and materials. The Cornell Master Gardener manual is available on line. If you have a passion for volunteering and gardening, this training is the first step to becoming a Genesee County Master Gardener volunteer. Graduates of the program (Genesee county residents) are then eligible to apply to become a volunteer. A Master Gardener volunteer should have a willingness to give back to the community and help put into practice what they learned at training. Enthusiasm for sharing their gardening skills and knowledge is a must. For an application or to register contact Brandie Waite at 585-343-3040, ext. 101, visit our website: genesee.cce.cornell.edu or stop by the Extension office located at 420 E. Main St. in Batavia.